WikiLawn is a region-specific lawn care blog that gives actionable advice to homeowners. Select pages recommend lawn & garden services, equipment, and local professionals for hire. 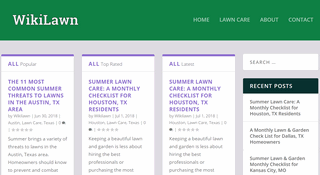 Articles are thoroughly checked for accuracy before publishing and cover topics such as lawn care, landscaping, gardening, and more around the lawn care industry.